I’m always happy to see signage that is positive, but I was OVER THE MOON when I saw this sign for credit/debit card use while I was on vacation. I see so many signs that say “$5 DOLLAR MINIMUM” or something like that and it really bums me out. 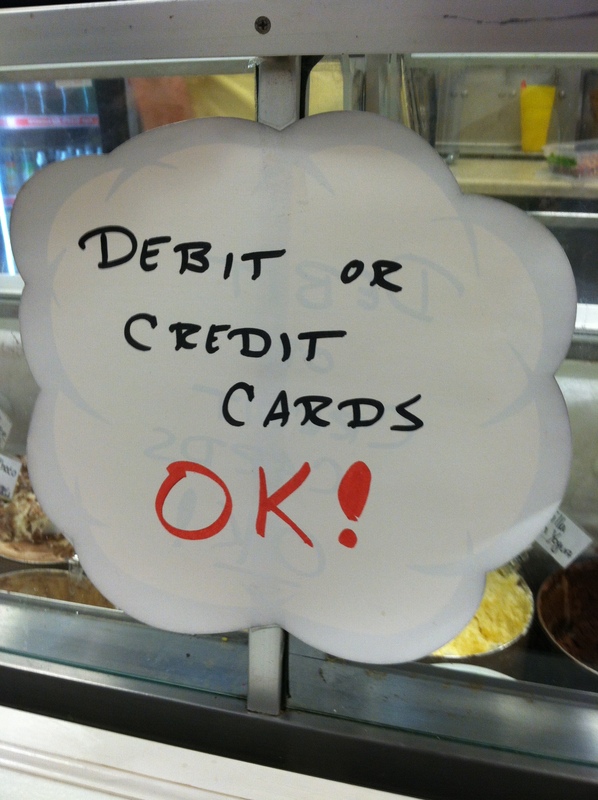 I understand that businesses have to pay a fee on these transactions but I feel that these signs just make me feel bad about choosing to use my debit card instead of carrying cash. When I saw this sign, I smiled. It also led to them getting more business…my family and I were back for ice cream the next night! There is nothing worse than going in for a quick bite to eat only to discover a sign that says they only accept cash or they only accept cards over a certain amount. It’s the way the world is moving and I think businesses just need to accept that and move forward with the technology. Imagine how much it will change with NFC! Yeah. I’m really excited for NFC. How come it is taking so long to become popular?